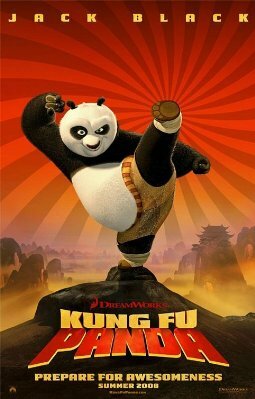 Being a great of kung fu movies, I aboslutely had to see “Kung Fu Panda“. Even though it is an animation, it still features Jackie Chan and lots of kung fu training and fights. I don’t know what it is about kung fu movies that drags me in and occupies my attention, but it’s always the same. And “Kung Fu Panda” was no exception. And it wasn’t a disappointment. Great animation, good humor, and the best of kung fu – it’s all there. The last dumpling fight is up there with the rest of the best kung fu fights. And an extra point for choosing the animals for characters and kung fu styles. Lots of fun. Overall, a 7 out of 10. Recommended for any fans of animation, Jack Black, or kung fu movies. I was waiting to see “Around the World in 80 Days” for some time now. I thought it had a potential to be one of very good movies. It turned out I was right. It is an excellent movie for both kids and adults. There is an interesting and well-known story behind it, which has everything – adventures, action, love, friendship, humor, and whatever else you want. But not only the story is great. The realization of that story in this film is great. It is almost perfect (except for a bit longish ending, but who counts?). And it is way better then I expected. Computer graphics and decorations design deserve a special mention. They bring back the magic of Disney animations from back when those guys did something fascinating. Mutation waves between movie and animation are mostly used to glue days together and they look really nice, causing a “Wow!” from the somewhat younger audience in the cinema. Overall, I would easily give this movie a 8.5 (closer to 9) out of 10. DVD with this film should be a nice addition to a home collection and nice family time passing.